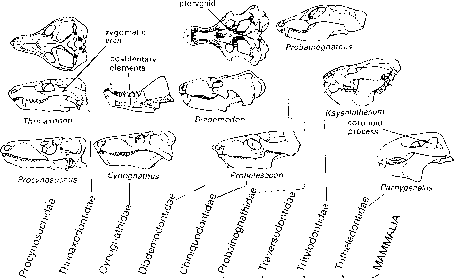 The Palaeocene Epoch (65-56 Myr ago) marks the first phases of the radiation of the placental mammals. While Australia, South America and Africa acquired their own largely unique faunas, the northern continents were home to the Boreoeutheria (see Box 10.6). The death of the dinosaurs must have left vast areas strangely empty of large land animals. A sample of life just after the world began to fill up with mammals may be seen by studying a well-known Palaeocene fauna from North America (see Box 10.7). The leptictids are small shrew-like insectivorous forms that existed from the early Palaeocene to Oligocene in Asia and North America. Leptictis,a late form, has a long snout lined with small sharp teeth (Figure 10.26(a)), evidently adapted for puncturing the skin of insects. The leptictids are primitive in many characters: for example, they retain the jugal, a bone lost in true insectivores. They may be related to zalambdalestids (see p. 312), based on an analysis of postcranial characters (Rose, 1999). The pantolestids are otter-like animals with skulls up to 150 mm long, known from the Palaeocene to Oligocene of North America and Europe. They have broad, thickly-enamelled molars that may have been used in crushing shellfish, and large powerful canines (Figure 10.26(b)). Fish remains have been found in the gut region of Buxolestes and perhaps the pantolestids lived like seals or otters. The apatemyids are another small group of insect-eaters with no obvious descendants, known from the Palaeocene to Oligocene of North America and Europe. Sinclairella (Figure 10.26(c)) shows the strange dentition, part insectivore and part rodent, that characterizes the group. The cheek teeth are adapted for puncturing insect skins, and the incisors are extremely long and projecting, rather like the front piercing teeth of the aye-aye (see p. 366). The anagalids dominated Asian Palaeocene faunas. Their broad molars indicate a diet of plant food and the anagalids are reconstructed as being rather rabbit-like in habits and appearance. They are primitive in retaining a postorbital process behind the orbit (Figure 10.26(d)), but the tooth row of the lower jaw is set well below the jaw joint. The anagalids have been said to be close to the origin of rodents and rabbits, but that is uncertain. The taeniodonts were a small group of North American Palaeocene and Eocene herbivores that ranged up to pig-size (Schoch, 1986). Stylinodon (Figure 10.26(e)) has short limbs and these are rather odd in that the fore-limb and hand are larger than the hindlimb and foot. The claws are narrow and curved and they were probably used for digging up succulent roots and tubers. The tillodonts, from the Palaeocene and Eocene of Asia, Europe and North America, are a second small group of herbivores whose relationships are as much a mystery as are those of the taeniodonts. They were up to bear-sized and most fed on a diet of tough plant material like the taeniodonts. The pantodonts, from the Palaeocene to Oligocene of Asia and North America, may be related to the tillodonts. They were rooting and browsing forms that ranged in size and appearance from pig to hippo, and some were even superficially like ground sloths. Titanoides, a pig-like animal (Figure 10.26(f)), has massive limbs, plantigrade feet (soles flat on the ground) and digging claws on its hands. Later forms may have been semi-erect.